Mariano Rivera won the AL Relief Man Award in 1999, 2001, 2004, 2005, and 2009. The Rolaids Relief Man Award was an annual Major League Baseball (MLB) award given from 1976 to 2012 to the top relief pitchers of the regular season, one in the American League (AL) and one in the National League (NL). Relief pitchers are the pitchers who enter the game after the starting pitcher is removed. The award was sponsored by Rolaids, whose slogan was "R-O-L-A-I-D-S spells relief." Because the first closers were nicknamed "firemen", a reference to "putting out the fire" of another team's rally, the trophy was a gold-plated firefighter's helmet. Unlike other awards, such as the Cy Young Award or the MLB Most Valuable Player (MVP) Award, the Relief Man was based on statistical performance, rather than votes. Each save was worth three points; each win was worth two points; and each loss was worth negative two points. Beginning with the 1987 MLB season, negative two points were given for blown saves. In the 2000 MLB season, the term "tough save", which was worth an additional point, was introduced by Rolaids. A "tough save" happened when a relief pitcher entered the game already having the potential tying run on base, and got the save. The player with the highest point total won the award. The inaugural award winners were Bill Campbell (AL) and Rawly Eastwick (NL); Campbell also won in the following season. Dan Quisenberry and Mariano Rivera each won the AL award five times, while Rollie Fingers and Bruce Sutter won the award four times each. Lee Smith won the award on three occasions; Campbell, Dennis Eckersley, Dave Righetti, John Franco, Éric Gagné, Randy Myers, Trevor Hoffman, Francisco Rodríguez, Heath Bell, and José Valverde each won the award twice. Sutter (NL 1979), Fingers (AL 1981), Steve Bedrosian (NL 1987), Mark Davis (NL 1989), Eckersley (AL 1992), and Éric Gagné (NL 2003) won the Relief Man and the Cy Young Award in the same season; Fingers and Eckersley won the AL MVP as well, in 1981 and 1992 respectively. Todd Worrell won both the Relief Man and the MLB Rookie of the Year Award in the 1986 MLB season. Rivera and Joe Nathan were the only relief pitchers to have tied in points for the award, and both were awarded in 2009. Goose Gossage, Fingers, Eckersley, Hoffman, Rivera, Smith, John Smoltz and Sutter were elected to the Baseball Hall of Fame. Craig Kimbrel (NL) and Jim Johnson (AL) were the final award winners in 2012. Sanofi acquired Rolaids from Johnson & Johnson unit McNeil Consumer Healthcare in 2013, but the award was not continued as a part of its marketing strategy. 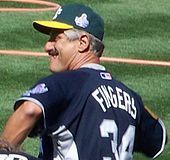 Rollie Fingers won the NL Relief Man Award in 1977, 1978, and 1980, and the AL Relief Man in 1981. Goose Gossage won the AL Relief Man Award in 1978. Lee Smith won the NL Relief Man Award in 1991 and 1992 and the AL Relief Man Award in 1994. Trevor Hoffman won the NL Relief Man Award in 1998 and 2006. John Smoltz won the NL Relief Man Award in 2002. Éric Gagné won the NL Relief Man Award in 2003 and 2004. Francisco Rodriguez won the AL Relief Man Award in 2006 and 2008. J. J. Putz won the AL Relief Man Award in 2007. Brad Lidge won the NL Relief Man Award in 2008.
a Won Cy Young Award and MLB Most Valuable Player Award in the same season. b Won Cy Young Award in the same season. c Won MLB Rookie of the Year Award in the same season. "Rolaids Relief Man Award Past Winners". McNeil Consumer Healthcare Division of McNeil-PPC, Inc. Archived from the original on February 16, 2012. Retrieved March 25, 2012. "Relief Man Award winners". Major League Baseball. Retrieved May 23, 2009. "Rookie of the Year Awards & Rolaids Relief Award Winners". Baseball-Reference. Retrieved May 26, 2009. ^ "About The Award". McNeil Consumer Healthcare Division of McNeil-PPC, Inc. Archived from the original on October 26, 2012. ^ "Cy Young Award winners". Major League Baseball. Retrieved May 23, 2009. ^ "Most Valuable Player winners". Major League Baseball. Retrieved May 23, 2009. ^ "Rookie of the Year winners". Major League Baseball. Retrieved May 23, 2009. ^ "Hall of Famers". Baseball Hall of Fame. Archived from the original on October 26, 2012. ^ Van Riper, Tom (April 10, 2014). "Why Can't Baseball Monetize It's Big Postseason Awards?". Forbes.com. Archived from the original on April 11, 2014. ^ Neyer, Rob (April 9, 2014). "Kissing the Rolaids Relief Award goodbye". FoxSports.com. Archived from the original on April 11, 2014.